The court discharged nine accused in the 2006 Malegaon blasts case, which was an indictment of former ATS chief KP Raghuvanshi. KP Raghuvanshi, former chief of Maharashtra's anti-terrorism squad (ATS), was understandably absent from the media glare around the Mumbai special MCOCA (Maharashtra Control of Organised Crime Act) court's order of April 25, 2016 that discharged nine Muslim accused from all charges in the Malegaon bomb blasts case of 2006. The retired additional director general of police had led the ATS investigation of the Malegaon blasts as well as the Mumbai train blasts of 2006. Just a few months earlier, in September 2015, he had been prominently present in the MCOCA court at the time of the delivery of the train blasts case judgment, handing out sound bites and interviews to the electronic and print media alike. This time around, however, he was nowhere near the court. Just three days before the court discharged the nine accused in the Malegaon case, Raghuvanshi had appeared in a lengthy exclusive interview with Times Now's Arnab Goswami on prime time television (see video below) defending his investigation and implication of the nine accused and expressing confidence in the trial court. Goswami, in his typical media trial fashion, had even delivered a verdict that he "believed" Raghuvanshi's version. However, when the actual trial court ruling came, Raghuvanshi was unavailable even to the Times Group. Times of India reported that he was "not available for comment, despite repeated attempts by TOI". Raghuvanshi's reticence obviously stemmed from the court's systematic demolition of his chargesheet and its drawing of conclusions which pointed categorically to Raghuvanshi and his men being involved in a string of actions that actually amounted to serious offences under the Indian Penal Code (IPC). 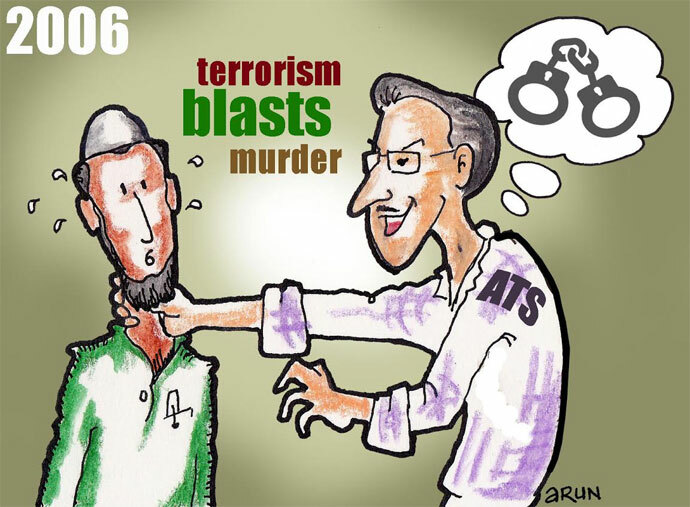 The ATS case rested on the confessions extracted from eight of the accused, one of whom was targeted to be made approver against the rest. When the case was handed over to the National Investigation Agency (NIA) the confessions were all shown to be obtained under duress, making them worthless as evidence under section 24 of the Indian Evidence Act. It was found by the NIA that the confessions in most cases could not be true as there was conclusive proof that the accused were actually at places other than they were shown to be in the confessions. Accused number two, Shabbir Ahmad, was actually in judicial custody at the time he was shown in the chargesheet to be participating in actions relating to the blasts. The obtaining of such false confessions, under duress, is an offence punishable with imprisonment up to seven years under section 195A and section 330 of the IPC. The other important evidence proffered by the ATS was the matching of soil samples from the blast site and the godown of accused number two which was shown to also contain RDX. The NIA verified this and found "that the panchas/witnesses who are shown on the panchanama of lifting soil were not present at the time of collecting the soil samples but present at some other place" (para 59 of the MCOCA court order). Such a discovery which has been upheld by the court is an extremely serious finding amounting to an offence committed by Raghuvanshi and his investigating team of fabricating evidence with intent to procure conviction for a crime, which is punishable under section 194 of the IPC with life imprisonment. It also raises questions regarding the source of the RDX shown, pointing to possible offences under explosives and terror laws. This would require a separate investigation. The court also debunked the core of the ATS' case to be "highly impossible and improbable" and "not a digestible story". The ATS showed that the accused were making bombs and holding key conspiracy meetings in the godown of Shabbir, accused number two, when Shabbir himself was in custody in a case under investigation by the ATS. Few things could be less believable. The judge also found the "basic foundation or the object" behind the blasts shown by the ATS to be "not acceptable to a man of ordinary prudence". He didn't believe the tale that a Muslim group aiming to stir up Hindu-Muslim riots had targeted a Muslim religious occasion rather than the Ganesh idol immersion that had just preceded the Muslim holy day. He concluded that the nine Muslim accused were innocent and had been made scapegoats by the ATS and therefore ordered their immediate discharge from the case. The discharged accused welcomed the court's pronouncement with tears of relief and prayers of thanksgiving. When one of the authors (Vernon) spent time with them in jail in 2007-'08 they had come across as simple men who had wrongly been framed. Though they had been shown to be leading activists of the banned Students' Islamic Movement of India (SIMI) and operatives of the Lashkar-e-Taiba (LeT), they did not show any signs that they shared the ideology and approach of these organisations. They spent their time in jail trying to be of some help to their fellow prisoners. Shabbir had some knowledge of acupressure and his skills were constantly on call - even by the jail staff. Sridhar, one of the co-accused, had his arthritic knees attended to by Shabbir. Vernon got advice on management of bleeding piles from accused number five, Farogh, when he met him in prison. Farogh was one of the two unani doctors implicated in the case. Their jail-time simplicity seems to have continued outside and most of them have not asked for anything more than the present court judgment. But would the MCOCA court judgment suffice? On the day after the judgment, India Today TV's Rajdeep Sardesai tweeted, "No outrage here? no hashtags/trends? No 'framing'? Who will give these men back their 10 years?" Others have called for compensation and punishment of the officers responsible. These calls for justice are correct and will probably go before the higher judiciary. Justice in a courtroom, however, cannot address a problem that goes somewhat deeper and extends much higher than Raghuvanshi and his men. Malegaon in 2006 was after all only one in a series of bombings of Muslim targets during 2003-2006, that included Parbhani, Purna, Jalna in Maharashtra, Modasa in Gujarat, Hyderabad, Ajmer and Delhi and also the attack on the Samjhauta Express. Most of these were falsely pinned on innocent Muslim men, thus leaving the field open for the actual culprits to continue their terror plans. It was only after the cracking of the Malegaon blasts case of 2008 during the eight-month tenure of slain ATS chief Hemant Karkare that further investigations were made, which made it clear that all these were the handiwork of Hindutva-inspired modules engaged in a deep conspiracy with links to the higher echelons of the Rashtriya Swayamsevak Sangh (RSS) and even the state apparatus. As the links started reaching higher there was a definite slowdown in the investigations during the United Progressive Alliance (UPA) rule. With the coming of the BJP in Delhi, there has been a systematic endeavour to subvert the cases. Investigators, prosecutors and witnesses have been pushed to toe the Centre's line. The cap was blown on this by the senior public prosecutor in the Malegaon 2008 case, Rohini Salian, who disclosed how she had been told by the NIA to go soft on the pro-Hindu group Abhinav Bharat that is believed to have been a part of the conspiracy. She was later removed as prosecutor. This plan of going "soft" on the Hindutva terror accused seems also to go hand-in-hand with going "hard" on Muslim accused. This was on display in the discharge of the nine Muslim accused a few days back, and the court order itself referred to the NIA doing a volte face. It had shifted from a "no evidence" stand of 2013 to a "no discharge" stand in 2016. With such directions from the top to the premier agency investigating these blasts, it should come as no surprise that most of the witnesses are turning hostile in the trials of Hindutva accused and there is only a remote chance of any of them getting convicted. This fixing of the court trials is then being used in recent months to run parallel media trials where the principal accused, particularly Lt Col Prasad Purohit, are beind declared innocent. 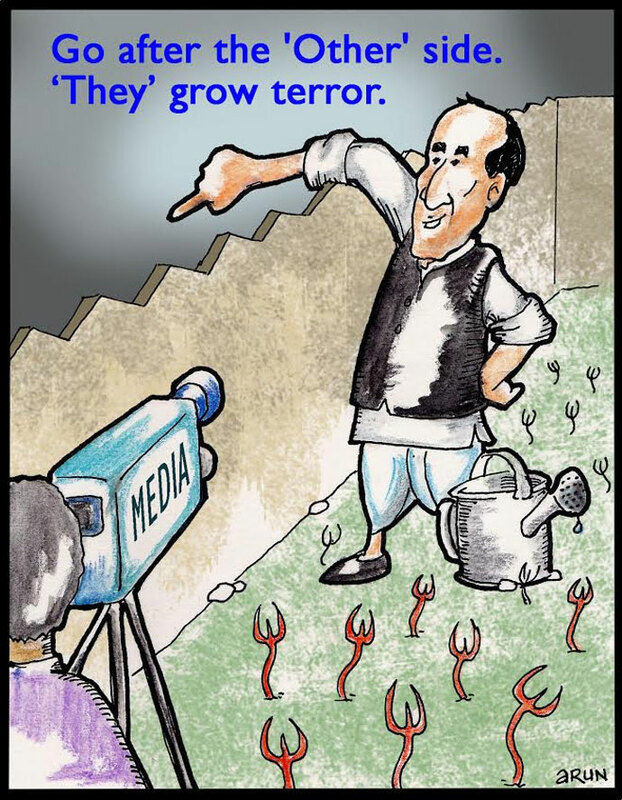 Thus the support to these terror accused, which was relatively discreet in the UPA days, is now on open display. It emanates from the highest levels of government and the state apparatus and from significant sections of the media and civil society. It is the type of support that aims at nurturing "our" Hindutva terror gangs that will supposedly keep the "other" communities in check. It is the type of support that the Pakistani ruling classes displayed for years to "their" terror operatives until things got totally out of hand. It will require more than courts of law to handle this malaise, if we are not to tread the path traversed by our neighbour.